The Cinque Terre is one of the greatest clean zones in Mediterranean Basin. It is located in Liguria, to the west of La Spezia in Italy. It is about 5 miles of rocky coast among two capes, hundreds of miles of beautiful paths, five small villages that located over the sea on the rocks. Cinque Terre didn`t suffer from massive expansion because of its history and position of local towns. Thanks to them the unique landscape was formed here with the stone walls located on a land, with the twisting coastal footpaths, with the most gorgeous beaches between capes and with crystal clear transparent waters. 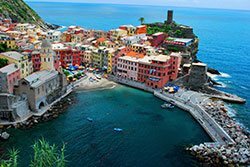 Cinque Terre offer not only sea, beautiful footpaths with breathing taking views, old churches, sanctuaries, oratories and some castles, diving in Riomaggiore and has food and wines of first quality. 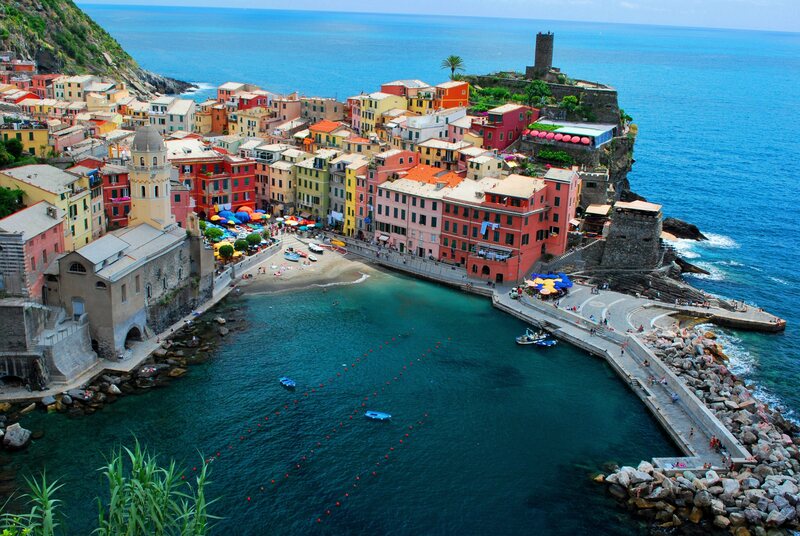 The Cinque Terre is a National Park of Italy since 1997 and is a UNESCO protected site. Cinque Terre consists of five villages (from north to south): Monterosso, Vernazza, Corniglia, Manarola and Riomaggiore. We would recommend you visit the individual pages for each of these cities: there you can find a list of all attractions with its locations on the map. This can greatly enhance your visit to Cinque Terre. If you have only one day for your visit we have a special page for you: "Cinque Terre in one day". Note, that on October 25, 2011 Cinque Terre suffered from massive flooding. Read about the current state and the results on this page. Portovenere and its islands is a UNESCO World Heritage site in addition to the Cinque Terre. This is a very beautiful city in the region, and we strongly recommend that you visit it. For more information about it use this website.